Thelma in back on left. The other woman is unidentified. 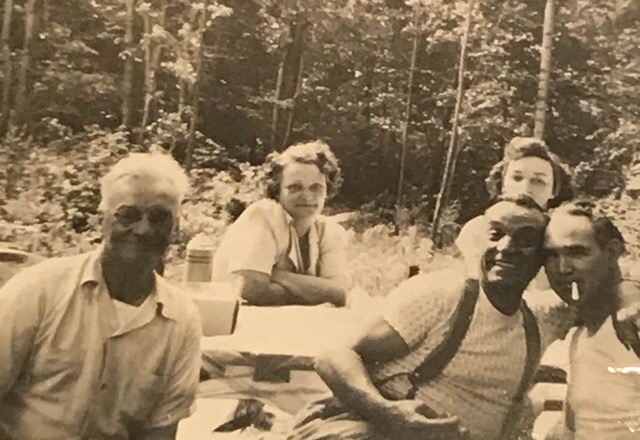 Front (left to right) - Frederick Earle (1890-1957), possibly one of her brothers, and Thelma’s husband, Charles G Hoye Sr. (1904-1975). It’s difficult to imagine how Thelma might have developed any playfulness at all given her decades of experience with an abusive father, a mother with mysterious family roots, and, eventually, a chronically philandering husband. But there was joy to be had and Thelma seemed determined to have it. What follows is pieced together from genealogical records, the reminiscences of Thelma’s granddaughter, Elaine, and some occasional imagining about the Storied Life of Thelma Earle Hoye. The seventh of eight children, Thelma was born on April 12, 1906 to the “heavy handed” James Westley Earle (1865-1941) and her mother, Margaret Tucker, known as Nellie (1875-1924). Though born a “Tucker,” Nellie had been raised primarily by a family with the name Decator. Information about Nellie’s birth parents remains mysterious, despite many years of family research into the matter. Difficult to know for sure, but it seems likely the cloud surrounding Nellie’s origin story, the lack of any clear family continuity, would have tinged Thelma’s own already-unstable experience growing up. Thelma’s parents were married on April 20th 1889 in Wallaceburg, Ontario, a town once known for its lumber and shipbuilding industries and presently as the “glass town of Canada” for its glass production. This appeared to be where Nellie’s adoptive family, the Decators, lived. Nellie and James made their home and grew their family in Marine City, Michigan, a town not far from Wallaceburg, on the banks of the St. Clair River that connected the larger Lake Huron and Lake St. Clair. It also served as an international border between Canada and the United States. The 1900 U.S. Federal Census shows the family living on Bruce St., a main East-to-West street in the center of town. Thelma’s four oldest siblings, Frederick (1890-1957), Claude (1892), Alpheus (1894), and George (1898), lived there. Any home that existed there in 1900 is likely long since gone, replaced by more recent modest single family homes built in the 1930s and 40s. Aerial view of Bruce St. in Marine City, MI. Two more of her siblings were born, Morley (1901-1965) and Mildred (1904-1936), before Thelma, who arrived in 1906, by which time the family had made their way to Detroit, MI. By 1910, with the addition her younger brother Robert (1909-1956), census records show that Thelma’s family was living at 1315 Baldwin St (present day 5527 Baldwin) in Detroit. This is further corroborated by a 1908 Detroit Free Press article detailing Thelma’s brother Claude robbing a grocery story that appears to have been owned by his older brother Frederick! Perhaps, like those apples, canned baked beans also taste better when stolen. Here is a photo of five of the Earle siblings quite possibly on the front porch of that Baldwin St. home. It certainly doesn’t seem like a joyous occasion for any of them, including the parents. Thelma (front row on the right) sitting with 4 of her siblings, flanked by their parents, Nelllie and James. The boys (left to right) are: Alpheus, George, and Morely. Mildred is next to Thelma. Likely at their home on Baldwin St. in Detroit, MI. Here is that address as seen today. Built in 1906, the home has obviously had some major updates. The general bones of the home, however, especially the structure of the porch and the bay window on the right side, seem consistent. Through it all it seems clear that Thelma’s parents were not happily married. By 1915, Nellie had petitioned for divorce from her husband for “extreme cruelty.” Despite being uncontested by James, the split wasn’t officially approved until Halloween of 1922, a curiously long seven years after the initial petition. Another early photo of Thelma (right), probably taken around 1916, shows her near age 10 with her younger brother, Robert, around age 6, and her sister Mildred, about 12. In the middle of them all sits a stern, somewhat blank James Earle. Formal in a suit, tie, and hat, he is a series of severe angles, gaunt in the face, with a straight line for a mouth. Nellie, the wife and mother, is absent and one can presume that Thelma’s parents were separated at this time. Regardless, there is no joy here. Not yet legally divorced, James would go on to marry a Minnie Schoenrick, a divorcee herself (her prior married name was Price) around 1916. By the sparse accounts available, often second or third hand, Minnie seems to have been the proverbial “wicked stepmother.” She and James were not kind people to begin with, and Minnie was particularly mean to Thelma. Her story remains an elusive one, but one can imagine the additional suffering Thelma experienced by way of an already cruel father finding a partner in crime. Here is a later photo of James Earle (right) with an unidentified man. Is that Minnie next to him? It is a reasonable speculation. It appears that a lack of any official divorce declaration did not keep Thelma’s mother from marrying again either, as she wed a Mr. Eugene Adams, a “collector” according to county marriage records, on September 13, 1919. The 1920 U.S. census shows Nellie and Eugene living with Thelma and five of her siblings at 586 (present day 8134) Sylvester St. in Detroit. The turn of the new year from 1923-1924 was a transformative and tumultuous time for Thelma. On December 29th, at the age of 17, she married 19-year-old electrician Charles Hoye in Detroit. Witnesses to the marriage were “James Earle” and Mildred L. Earle, her older sister. It seems unlikely that Thelma’s troublesome father would serve as a witness, but his name does appear on the official record. Marriage records indicate that Thelma and Charles were married by clergyman H. Midworth. In 1923 there was a Rev. Harry Midworth who preached at the Church of Our Savior, an Episcopal congregation at the corner of Cadillac and Harper on Detroit’s East Side. It is hard to know for sure, but it seems likely that Thelma and Charles walked these streets and entered this now crumbling former house of worship. Corner of Cadillac and Harper on Detroit’s East Side, site of the former Church of Our Savior Episcopal Church where Thelma and Charles married in 1923. If the marriage between Thelma and Charles seemed rushed it was for an understandable reason. Four months after being married, three days shy of her 18th birthday, Thelma gave birth to her first child, Charles Glenn Hoye Jr. (1924-2009). It is hard to say whether a rash she remembered having during pregnancy (much later surmised by family members to have been measles) was a cause, but Charles Jr. was born with a shortened, deformed left arm and a hand with a very tiny palm and only three fingers. An early childhood surgery created a makeshift elbow and positioned the arm further toward the front of his body. The procedure left considerable scarring, along with physical and, no doubt, emotional sensitivity. Despite Thelma working to sew his shirts to fit properly, one would expect that he spent much of his life fending off unkind comments. As a child, he had clearly learned well to hide his arm in most photographs. Three weeks after Charles was born, on April 28th, 1924, Thelma’s mother died. It seems likely from her death certificate that Nellie had been ill for some time. That she did not serve as a witness at Thelma’s wedding suggests the likely possibility that she had been too ill to attend. It is hard to know what, if any, relationship Thelma had with her father after her mother died. He lived another 16 years, until in 1941 he fell from a scaffolding to his eventual death, which was reported in several papers. There is no record of just what Thelma felt about her father’s death. Perhaps nothing. Perhaps relief. Perhaps a quiet bit of justice. Thelma and Charles had two more children, George Earle Hoye (1927-1969) and Marian Earle Hoye Schultz (1928-2006) and by 1930 the family of five was living at 9145 Norcross St., in Detroit. By 1940 the family had moved to the suburbs in neighboring Roseville, MI. They lived at 26855 Normandy. In many ways Thelma was a typical housewife and mother of the 1930s and 40s. Her husband worked as an electrician at the Borden Creamery, likely at the plant near their home at 22351 Gratiot Ave. East Detroit. Thelma raised and cared for the children. In his free time Charles would hunt. And she became known as a pretty decent cook. Thelma’s experience with her own father, unfortunately, probably set the stage for an unhappy marriage. As a wife, Thelma experienced mistreatment, neglect, and certainly infidelity. Perhaps it was not as vicious as the outright abuse experienced at the hands of her father, but one is left with the impression that Thelma’s marriage was bereft of much love or compassion. Her granddaughter speculated, years later, that Thelma likely had no idea what she was marrying into. How could she? She was only 17. Perhaps she came to view Charles’ womanizing ways and curt treatment of her as normal and to be expected. Apparently though, Charles was a decent enough grandfather. “To be honest I have to say he was a good grandfather to me. Not overly involved, but good to me,” his granddaughter recalls. Somehow, throughout a life that had clearly been very difficult, Thelma seemed to carry a capacity for fun, though it was usually what might be called an edgy fun. Having become a grandmother at the early age of 42, she brought energy and zeal to the role. Her granddaughter Elaine recalls many instances that were, while perhaps not totally appropriate, undeniably exciting. Another time, out driving with Elaine and her friend Peggy, they came upon the old, worn wooden sign for Buckview Camp. The painted letter “B” had faded in a way that had made it an “F.” The girls sounded out the scandalous name and giggled, but, as Elaine tells it, Thelma said it aloud with total innocence, seemingly unaware of what the new word implied. Enjoyment for Thelma and Charles sometimes involved drinking. At home, it was 7 & 7s or Schlitz beer. A small dish of Beer Nuts nearby (and a handful always atop Elaine’s bowl of ice cream). But often they would make the drive to meet their community of friends at the beer garden. Perhaps this is when Thelma would wear her perfume of choice, Midnight in Paris. Elaine would often bring a friend of hers and they would be let loose in the side room with a handful of coins to play the pinball machines or elicit songs from a player piano. But Charles was not a fan, either of the song or Thelma’s singing. As soon as the first line rose from her mouth he slammed on the brakes and turned to her a cold, bleary-eyed stare. She stopped, one would expect with a knowing grin, and he would press his foot again to the gas pedal. Until she would start again with “Mairzy Doats,” and again he would slam them to a stop, stare, and then proceed only when Thelma went silent. Then, again. Again. Again. It took forever to get home. After Charles retired he and Thelma moved to West Branch, MI, a few hours to the North. This move was, in part, due to the construction of the Walter Reuther Freeway (I-696) a huge east/west thoroughfare in the Detroit suburbs. Construction began in 1961 and many homes along its path were purchased and demolished to make way. Thelma wasn’t particularly fond of West Branch, or the “cottage” that they lived in, but she sure did like going to “The Club.” This was the West Branch Country Club, which probably sounds fancier than it actually was. This is where Elaine was introduced to the exotically ubiquitous Waldorf Salad: iceberg lettuce, celery, mayonnaise, and a diced, most likely non-stolen apple. She can’t see it on a menu today without reminiscing fondly about her grandmother. In late summer, 1964, Thelma made more thrills by taking several of her grandkids (unfortunately Elaine was too young) to the Beatles concert at Olympia Stadium in Detroit. Whether “Mairzy Doats” or “Twist and Shout,” Thelma clearly enjoyed her music. The Beatles only played a couple of shows in Detroit and it seems near certain that Thelma was somewhere sitting in the bleachers, bopping her head, at this very concert. Occasional poor judgment notwithstanding, Thelma was a fully engaged grandmother to her grandchildren, and it was very appealing to Elaine. More pastoral expressions of Thelma’s awareness of her grandchildren, her real engagement with them, exist. She took knitting lessons with her 11-year-old granddaughter Jackie. Perhaps the most idyllic way her willingness or desire to break the rules created wonderful comfort would come on Michigan summer nights when the house was sweltering inside. Thelma would gather a blanket and lead Elaine’s sister Donna outside to the cool ground beneath a giant willow tree where they would spend the night. One can imagine the slight breeze through the delicate mass of leaves, the skin cooling, and Thelma’s voice in the dark, perhaps singing, perhaps just wishing Donna sweet dreams. It seems Thelma’s fun often came with a good dose of defiance. And who could blame her? She was her entire life in precarious situations with or at the mercy of harsh or abusive men. To have fun, an impulse she somehow kept alive despite her often brutal life, meant to do so in the context of threat. Perhaps her life taught her that joy was a little bit better when mixed with danger. So even the genuine acts of a loving grandmother were often tinged with deceit or danger or chaos. That a woman who suffered so is so fondly remembered as lively and engaged and fun by her granddaughter seems an accomplishment of great value. Let us help discover and tell your stories or those of someone you value. To learn more, discuss your project, or request a quote please fill out the form below. Your Storied Life is waiting to be told!